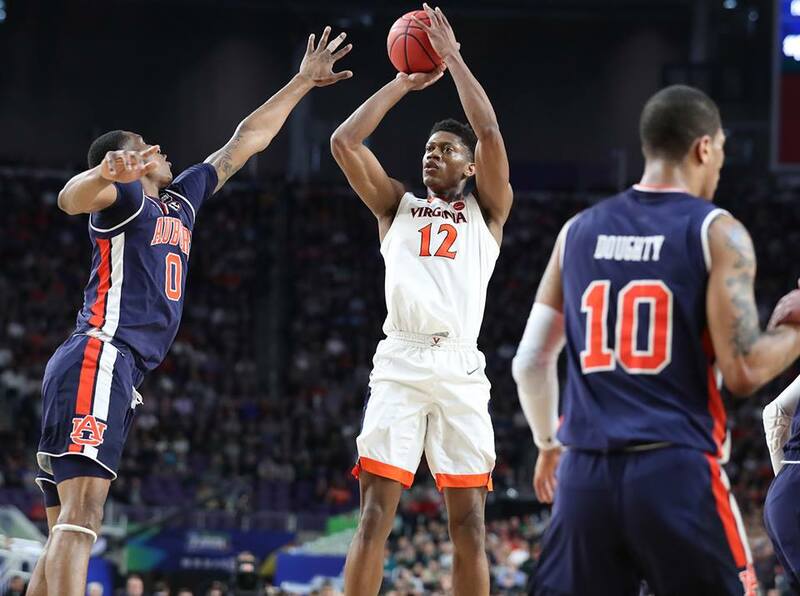 MINNEAPOLIS – Ty Jerome had a simple message for De’Andre Hunter as Virginia wrapped up halftime. “He said I’m the best player in the country and the team needs me,” Hunter said. Message received. Hunter elevated his game on college basketball’s biggest stage and helped Virginia dispatch Auburn, 63-62. The sophomore opened the second half with a driving dunk on a pass from Kyle Guy, drew a trip to the free throw line, made a short pull-up jumper, and blocked Bryce Brown’s dunk attempt at the rim all in the first two minutes of the second half. That initial flurry erased a 31-28 halftime deficit and helped put UVA in control for most of the second half. He said he wanted to be more aggressive and used shot fakes to get past the Tigers. Hunter wasn’t done, though. He broke up a tie score with an offensive putback with 13:21 to go and then made a scooping layup between defenders for a 40-36 lead with 12:37 remaining. Out of a timeout with 6:16 left to play, Hunter brushed off contact on a drive and made a strong layup at the rim. The forward just missed another putback that could have stopped Auburn’s late-game surge with an offensive goaltending call. He must missed an assist on a drive and dish to Mamadi Diakite in the final 2:17 as well due to an Auburn foul and Diakite missed both free throws. In the end, Hunter finished with 14 points on 7-of-11 shooting. He added 5 rebounds, 2 assists, and 2 blocked shots. Hunter made all 5 shot attempts after halftime and pulled down 4 rebounds in the second 20 minutes. Before the late-game drama unfolded at U.S. Bank Stadium on Saturday night, Virginia and Auburn were engaged in a back and forth duel through the first 30 minutes. Just after the 10:00 mark of the second half, the Tigers’ Samir Doughty knocked down a 3-pointer that pulled his team within a point at 44-43. At that moment, the game’s largest lead for either team had been 5 points. With the crowd roaring and the stakes growing, a Cavalier ran off a baseline screen, stopped in the corner, and let a 3-pointer fly that jump-started a 13-4 run. That player was freshman guard Kihei Clark, who said it came within the normal flow of the offense and he just read the defense and took the opening. The Hoos found a way to win the game, in part, thanks to Clark’s continued big moment plays in this tournament like that one. Against Gardner-Webb in the opener, he came up with a couple of assists and a 3-pointer just ahead of the half to help settle things down for a comeback. When Oregon took a 45-42 lead in the final six minutes of the Sweet 16, it was Clark that wrapped around a screen and answered with a 3-pointer on the very next possession. Against Purdue … well, everyone knows about the pass before the shot that saved UVA’s season. And then another big 3 in the final 10 minutes of the program’s first Final Four since 1984. Clark just seems to have a knack for coming through when the bright lights are intensifying. Virginia ranks No. 3 nationally in 3-point defense as teams have hit just 28.7% of their triples against the Hoos. That part of the D got a tough test Saturday. Auburn ranked 21st nationally with 38.1% shooting from 3-point range this season. The Tigers had been even better in the NCAA Tournament at 40.5% in the four games to get to the Final Four. That included 43.3% against Kansas with 13 3’s and 45.9% against North Carolina with 17 3’s. The Hoos slowed down the long-range attack, though. Auburn made just 9 of 31 attempts for 29.0% shooting. That number actually improved in the final 4:30 as the Tigers made 3 of their final 5 tries. Prior to that, they’d hit just 6 of 26 3-pointers for 23.1%.